Where: Legacy Village, 25001 Cedar Road, Lyndhurst, OH 44124. About: Proceeds support breast cancer research at Universtiy Hospitals Seidman Cancer Center. 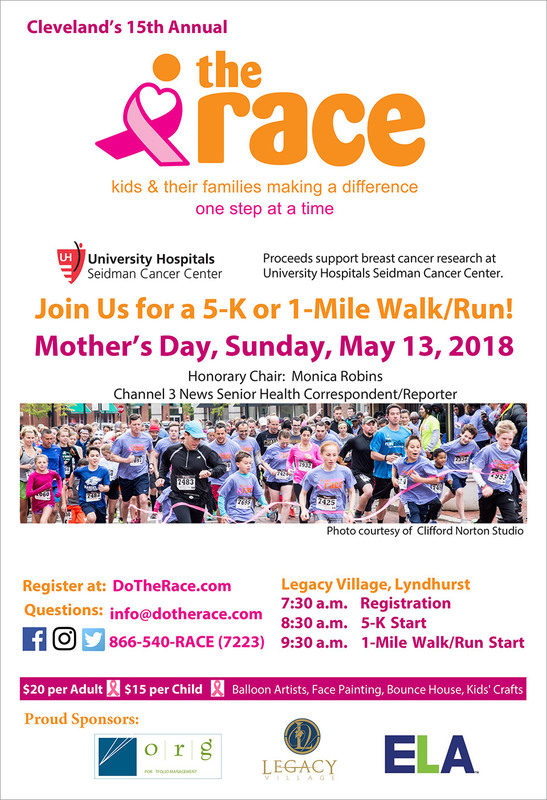 Join us for a 5-K or 1-Mile Walk/Run! Mother's Day, Sunday, May 13th 2018. Honorary Chair: Monica Robins. Channel 3 News Senior Health Correspondent / Reporter. Balloon Artists, Face Painting, Bounce House, Kids' Crafts. Cost: $20 per Adult. $15 per Child.